"On the Absorption and Radiation of Heat by Gases and Vapours, and on the Physical Connexion of Radiation, Absorption and Conduction." Philosophical Transactions of the Royal Society of London. London: Taylor and Francis, 1861. 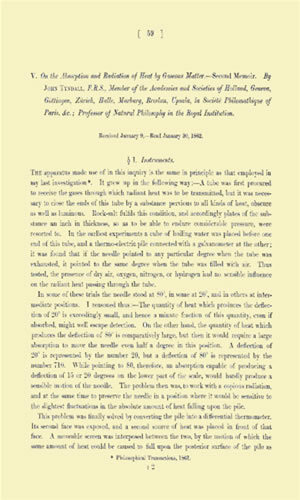 Tyndall's paper is considered to be the the first empirical evidence and explanation of "the greenhouse effect"; one of the most important papers in the field of climate change science.